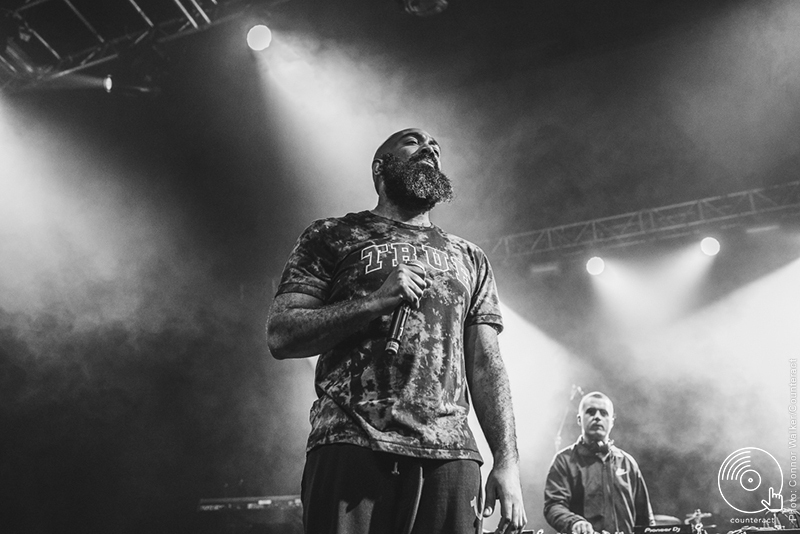 Kicking off the second of three homecoming shows was Murkage Dave, the grime artist that has collaborated with the likes of Jaykae (previous support of the band) and with Mike too for the ‘In The Third Person’ podcast. 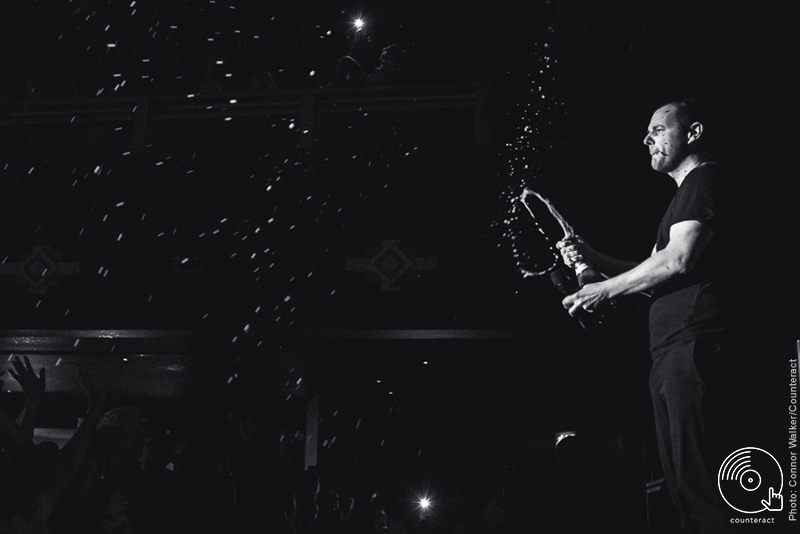 With his debut album only arriving last year, the set was special for Murkage Dave. 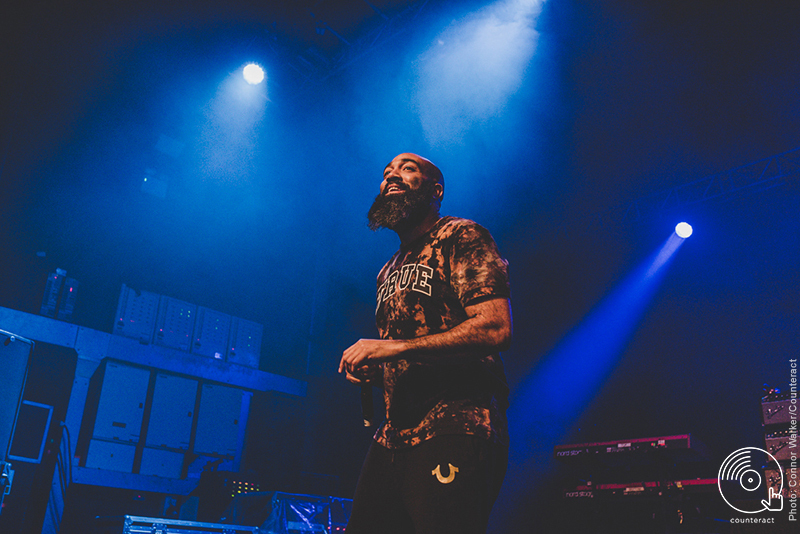 He worked his way through his new tracks with comfort and passion, and it becomes increasingly obvious why he earned his place as support for The Streets. The lyrics are expressive and honest, much like that of Skinner’s as he gets reflective about life: “I asked you to leave me alone, now I’m lonely”. The melodies of ‘Put You On My Shoulders’ and ‘You Always Ring Me When I’m Busy’ are chilled and especially easy to sit back and have kick off your Friday night. Murkage Dave is soulful, talented and has a genuinely nice voice. His openness had the room feeling like they had re-found The Streets, and what a feeling that is. Next up, The Manor. 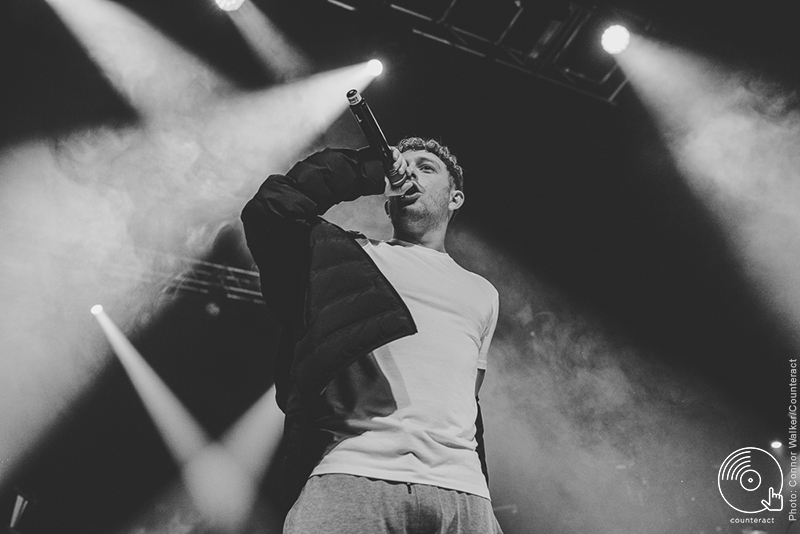 Another impressive act and perfectly placed in between the first support and main act as the vibe is right in line with Murkage Dave – just more upbeat and a nice transition into The Streets. The venue, as it started to swiftly fill up from corner to corner, was taken through tracks like ‘Ibiza’ with its definite summer vibe and ‘Creps In The Rave’ which sounds alike Kurupt FM. The trio bounced around the stage, confident in their sound. It was impossible to escape their infectious vibe and impossible not to be transfixed for the next half an hour. With an album four years old, The Manor were professional yet keen. The South-London three piece are a treat for fans of The Streets with their creations of grime and rap. Don’t Do What We Did is a timeless EP, just like every album of Friday’s headline act. 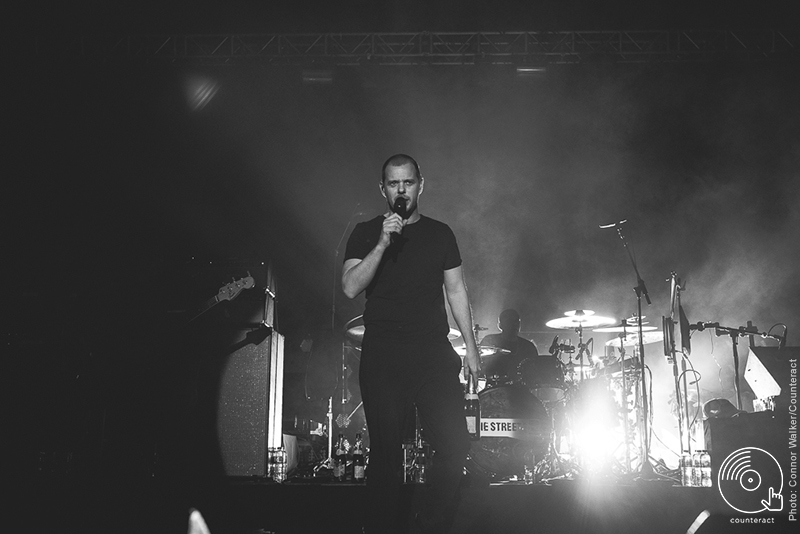 The Streets‘ set began with the iconic sound of ‘Turn The Page’ as Mike calmly walked on to the stage in his classic black t-shirt. 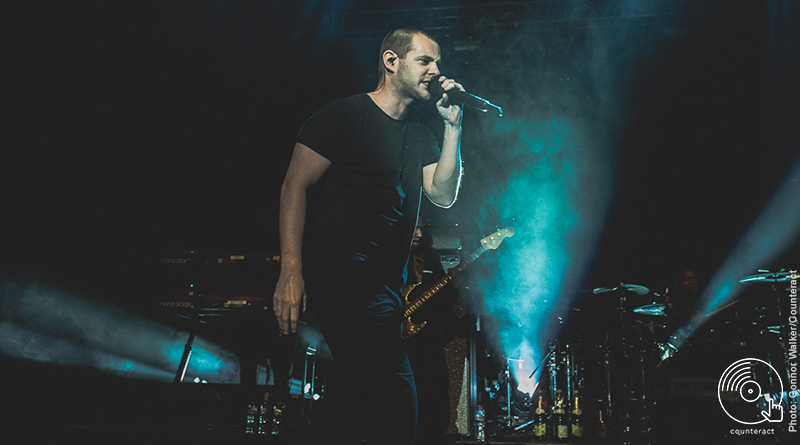 It makes utter sense to start The Streets’ homecoming gig with the very first track from Original Pirate Material, The Streets’ seminal debut: “That’s it, turn the page on the day, walk away, cause there’s sense in what I say…”. 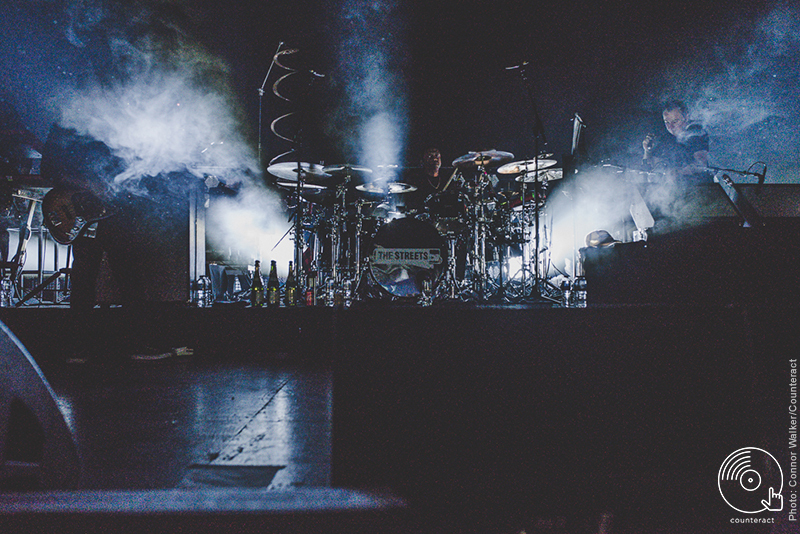 One glance around the bustling O2 Academy and it seemed like every person in the room dashed their pint of beer into the air at the appearance of Skinner on the stage. And from that, it is clear a big percentage of the room could well have been waiting seventeen years for this moment or eight years whilst the born-Brummie was away working on other projects. The night worked through the classics from the band’s back catalogue. ‘Don’t Mug Yourself’ is one that is re-started more than once, increasing the energy of the crowd more and more each time before Skinner screams into the microphone: “a new day another morning after, leaning back on my chair in a greasy spoon cafeteria!”. The whole set was scattered with Original Pirate Material tracks, taking it back to the very start again and again, reminding every gig-goer how far back their love for The Streets really goes. It is hard not to think of Skinner’s honesty and musical genius as he performs songs like ‘Never Went To Church’ and ‘Dry Your Eyes’. Every emotion is covered in the next 90 minutes, from the anthem ‘Fit But You Know It’ to garage track ‘Has It Come To This?’ Skinner seriously pulled it out the bag with an appearance from Jaykae for their collaboration ‘Boys Will Be Boys’. The fellow Brummie stormed the stage with nothing but energy, passion and excitement to be there. The pair embraced afterwards, showing genuine friendship and Jaykae’s honour to be by Mike’s side in Birmingham city. 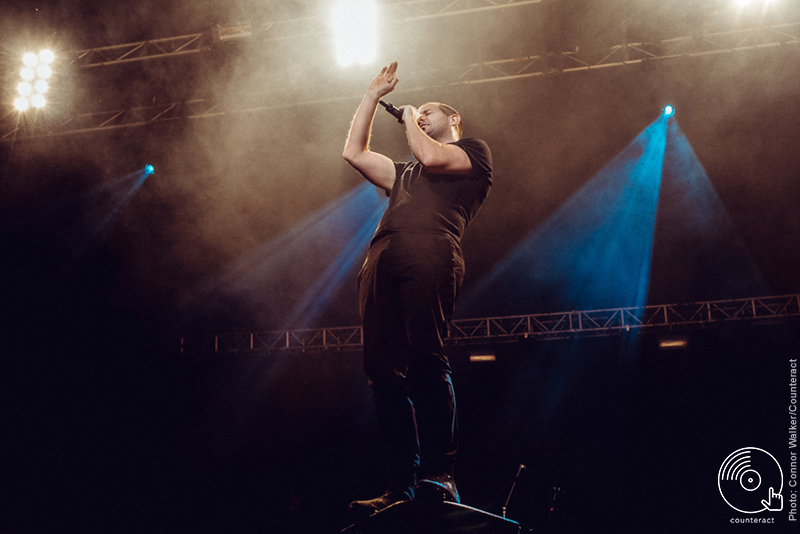 Grim Sickers also accompanied the night for ‘Open The Till’ and ‘Call Me In The Morning’, the newest tracks to emerge from The Streets last year. The night ended in the least expected way possible. After an encore, Mike’s famous leap into the crowd and a few minutes crowd-surfing on top of fans, a few calm and reassuring words from the frontman confirmed his dislocated shoulder: “Right. I need to go to the hospital, and have my shoulder put back in”. That is an end to The Streets gig nobody else will ever see. And that is a homecoming gig.